I need a new pocket knife. I've mentioned it before but the whore thread moves fast and things get lost. Ideally, I'd like roughly a 4" blade (slightly longer okay), folding of course, assisted or easy open, clip for my pocket and light weight. Budget up to $150 probably. Its Texas remember. We can carry swords and daggers openly so they don't care about our pocket knives. Also, lets show off all things sharp that we are proud of. For the price it’s hard to find fault with the ColdSteel Coad 4. In the same boat. Need a new EDC knife. Foldable, cross or button lock, assisted or auto, and my main thing is that it doesn't feel thin in my hands. The current carry knife is a CRKT that has this stupid secondary lock that I hate. I like the feel of the knife, but I hate the locking mechanism. which looks like my speed. 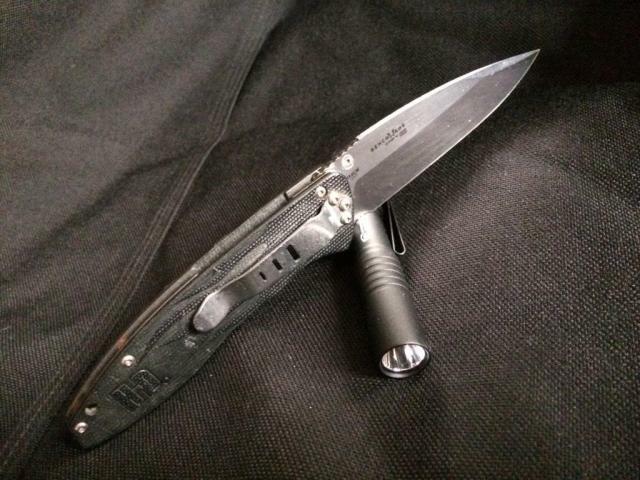 But since my last Boker I'm worried about blade softness and reliability. And, I don't like that the blade is down when clipped in the pocket. I've stabbed my leg before w/ knives like that. I have and HK branded Kershaw that I stopped carrying because it opened into my leg a few times. The CRKT that I'm rocking now is blade up when stored. Which I like. @Prime have you considered or looked into a Spyderco Manix2? Very similar. I too like partially serrated, and feeling thin bothers me. Not sure on the secondary lock, but it sounds unnecessary. It is. And stupid. Thus the hate. Benchmade....griptillian....multiple versions available,blade shape, colours, blade steels, etc. I love my crkt squid. Small blade, tip up carry, cheap, beefy. Nothing beats my spidey paramilitary 2. I have two of them and honestly can’t find anything better. My current edc is Benchmade little crooked river. Love it. Also have a collection of other benchmade, spyderco, Fox, crkt, and zero tolerance. Another I frequent edc is the spyderco yojimbo. Pic below from an old pocket dump challenge. Just picked up a spyderco para military 3 with g 10 handle. I really don't care for Spyderco knifes. I hate the hole in the blade, I hate how the blade looks like its made for dwarfs, I don't like how thin they feel. Blah. you can keep it. I really don't care foe Spyderco knifes. I hate the hole in the blade, I hate how the blade looks like its made for dwarfs, I don't like how thin they feel. Blah. you can keep it. I'm really impressed with the knife I picked up a couple months ago. I sharpened it for the first time tonight 5 swipes on the diamond stone was shave sharp again. I use it almost everyday and really don't have any complaints about it. Welp. Don’t think I’ll be buying benchmade anymore. Got any that you want to sell? I don't get the big deal. shiat was gonna happen anyway. They did the deed. Who ufcking cares? Just because they bragged about it on social media? Been hearing good things about this company. Benchmade assisting local Oregon PD by destroying firearms. Yes, those guns were mandated by the courts to be destroyed. But it opened up a can of worms. People started digging, and almost all of their political donations go towards parties against the 2nd amendment. Therefore any overhead they make from knives I buy get fed into this. That is the main reason I will no longer be buying benchmade. Don't mind the destroying as it was mandated by the court and they were helping the local PD. That was just the catalyst that blew everything wide open. Done. Good enough for me. How dumb is that to piss off your main audience by doing something so openly outlandish. I like to vote with my dollars. May not make a huge difference but it does to me.